Even though I’m busy dropping sweet corn in the boiling water, from the eyes in the back of my head I see what’s going on, or more accurately, what’s not going on. Uh huh. I roll my eyes and go back to pressing my chicken cutlets into the egg, into the breadcrumbs, then into the pan. “He’s not doing his homework.” My middle guy accuses. “Mommy, he’s not.” His affront is never mild. It’s always palpable. “You just concentrate on doing yours.” I say. Dip. Press. Flip. 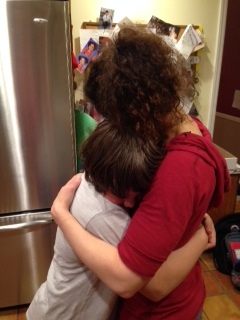 My oldest wanders in to take his place at the table but before he does, drifts over to me for a hug. He wraps his arms around my waist and I immediately respond to his warmth. He really is the sweetest boy. There aren’t that many almost 12 year-olds who love to linger in a hug with their mom. We start to sway a bit and all of a sudden it feels like a dance. I have a flash of my husband and his mother at our wedding; his dark head bowed to her blonde one, just a mommy and her baby slowly moving together to Through the Years; a public hug before 200 guests for a private moment where a son leaves his mother and takes a wife. So now I’m silently crying. My little guy giggles, “Mommy’s leaking!” and my oldest smiles sheepishly then pulls away. The dance is over, there’s homework to do and dinner to finish, but irrationally I don’t want it to end. Our time together seems suddenly shorter. “You’re not leaking,” Accuses my middle son who is also the defender of truth and justice, “You’re crying. It’s true Mommy, say it. Say it!” How did a prosecutor get in my little boy’s body? I looked at my boys. Not one of them was listening. They all amazingly had their heads down and were deep into their homework. Huh. Note to self. You don’t matter. “I’m hungry.” My oldest announced and my other boys piped in the backup chorus. Okay, so I do matter. For now. For the next few years, they need me and love me, but before I know it, they will be grown starting lives and families of their own and I will be wondering where the years went; where my babies went. “Dinner will be ready in ten minutes boys.” I assure them and pick up the pace. I don’t ever want this dance to end. Posted in Boys! and tagged dancing, growing up, parenting, the chicken dance. Bookmark the permalink. how quickly they tune out and shut off. haha! So sweet! I pray my son grows to be the same! Lovely. Have shared moments like that with my children…they become like photos in our heads. i have a terrible memory so i need to write them down so i don’t forget! So sweet. They still stay in your arms long after they have grown! My son is 22 and will still come and give me a great big hug for no reason. Yes, you will wonder where the years have gone…I do it all the time. But you will be enjoying wonderful young men who you have raised, and that will make up for it! i’m so happy to hear that! lucky you, i hope it stays for me as well..
Get’s it from his mama, I bet. So sweet! Spontaneous hugs, just because are wonderful! yes! please let them always be there!! My oldest still comes over and randomly hugs me. He is the sweetest, kindest boy. And this morning I made HIM cry. But not nostalgia tears. Tears of a demanding mommy trying to make his brain function early in the morning before she ran out the door for work and pushing too hard. Sometimes, I hate me. This got off topic quick. Sorry . . . I love all of this. You have the sweetest boys. This is the sweetest thing! I love your little “mom’s leaking” white lie. Makes me look forward to having kids sooo much! Wonderful, but it was pointless trying to explain to my fellow train travellers why I was laughing! You are so….Lois! See, Alisa, we are all in need of a Kleenex. I think you owe us a box! i know!! i’m so happy your boy is still sweet. but those girls.. oh man. it’s hard even thinking about letting them go. I miss those days. Although my son is 21 and commutes to school, he’s so busy and rarely home. I miss those days! Excuse me while I go grab a few Kleenexes! i love that you still call it a kleenex instead of a tissue!! and i hate too busy. we all need to just slow down and hug!! yay!! that’s a real coup!! So delicious. I love this post. My kids always take notice when I’m crying and laugh hysterically. Not sure how I feel about that. they really grow up so fast, but i guess we all do. kiss him up like crazy no matter what he says! happiest mother’s day! My baby girl is 12 now. I can totally relate. she’ll always be your little girl.